YOKOSUKA, Japan - The U.S. Navy’s only forward-deployed aircraft carrier USS Ronald Reagan (CVN 76) departed Fleet Activities Yokosuka, May 9. Ronald Reagan’s crew shifted colors at approximately 10 a.m. and made way to conduct sea trials in the final phase of the ship’s selective restricted availability (SRA) maintenance period which began Jan. 12. “I am extremely proud of the Reagan crew’s accomplishment up to this point of our SRA period,” said Capt. Buzz Donnelly, commanding officer. “We are all looking forward to completing sea trials and returning to operations in the 7th Fleet area responsibility. 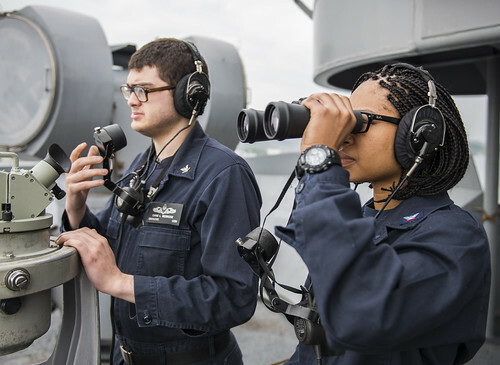 During sea trials, Ronald Reagan’s crew will undergo multiple training and qualification exercises to include engineering and medical drills as well as air, flight deck and hangar bay operations to evaluate the performance of Sailors and their departments. According to Donnelly, with Ronald Reagan’s newest technology and well-experienced crew, her return to operations in the 7th Fleet will mark a significant milestone for the forward-deployed naval forces, reaffirming the United States commitment to the region. Ronald Reagan’s departure from Yokosuka marks the first time the ship has been underway since completing her 2015 patrol, Dec. 3. Ronald Reagan provides a combat-ready force that protects and defends the collective maritime interests of the U.S. and its allies and partners in the Indo-Asia-Pacific region.